My aloe plant though had seen better days. It was actually a housewarming gift from our friend Eddie in 2009 and I had yet to repot it. Which explains why it was rather unhappy. So, one recent Sunday afternoon I sat down with my coffee, Pinterest, and plant, put some Joni Mitchell on, and got to work. I followed the instructions from this pin to replant it, and so far it seems to be doing well. Using the Miracle-Gro's Cactus, Palm & Citrus Potting Mix along with a base layer of pebbles that I used for the aloe, I also split and repotted this little haworthia limifolia that I had picked up from Ikea a few months ago. I hadn't really been paying it much attention, but when I looked at it it had two other plants that had propogated off the first one. These two got their own little pot while the mama moved up to bigger digs. And I moved this bright green thing up to a bigger house, too. I have no idea what it is and can't even remember where I got it, ha. A few months ago I repotted the bigger plants when I picked up a new addition. It was donated in a furniture pick-up my boss and I went on. We don't sell real plants in our store, so I happily offered to take it home. 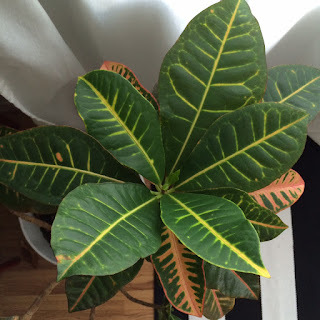 It's a variety of croton, but that's all I know about it. When I moved it into a real pot I moved my jade plant, snake plant and dracaena up to bigger ones, too. For these plants I used a moisture control potting mix, since I'm not always the best at remembering to water. Thank goodness for their hard-to-kill factor, right? They also seem to be relatively happy. The snake plant is struggling a little bit, but it was a messy replant, so I'm keeping my fingers crossed it improves a bit. The dracaena really responded well, though and has gotten much taller. 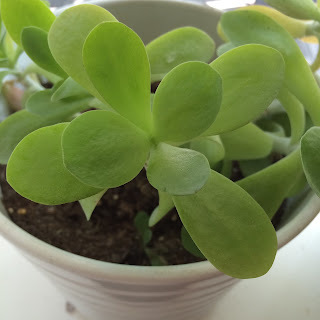 For all my plants I use Ikea's Kardemumma white pots. I love the bright white color. I like nearly everything in bright white. I like nearly everything from Ikea, for that matter. The graphic patterns on them make them just a bit more interesting. Excuse my wrinkly slipcover above. I'm just not the kind of person who iron's their slipcovers. The only plant I haven't had to repot yet is the golden pothos that was a housewarming gift from Josh's mother. Those plants really are almost impossible to kill. It lives in my office and probably gets neglected more than any other plant for that reason- I'm just not in there that often. However, a quick trimming of dead leaves and a hearty dose of water, and it will spring back to life in just a day. Luckily when I planted it I put it in my biggest pot, knowing what prodigious growers they are, so I don't foresee having to move it any time soon. To maintain all my improvements I water them once a week, if their soil is dry. Everyone seems to be happy so far. And if you don't have a green thumb, don't worry. Even I have a few fake's in my house. They're actually new additions that I bought for dark spaces or places where I know I wouldn't be able to keep a living plant successfully. 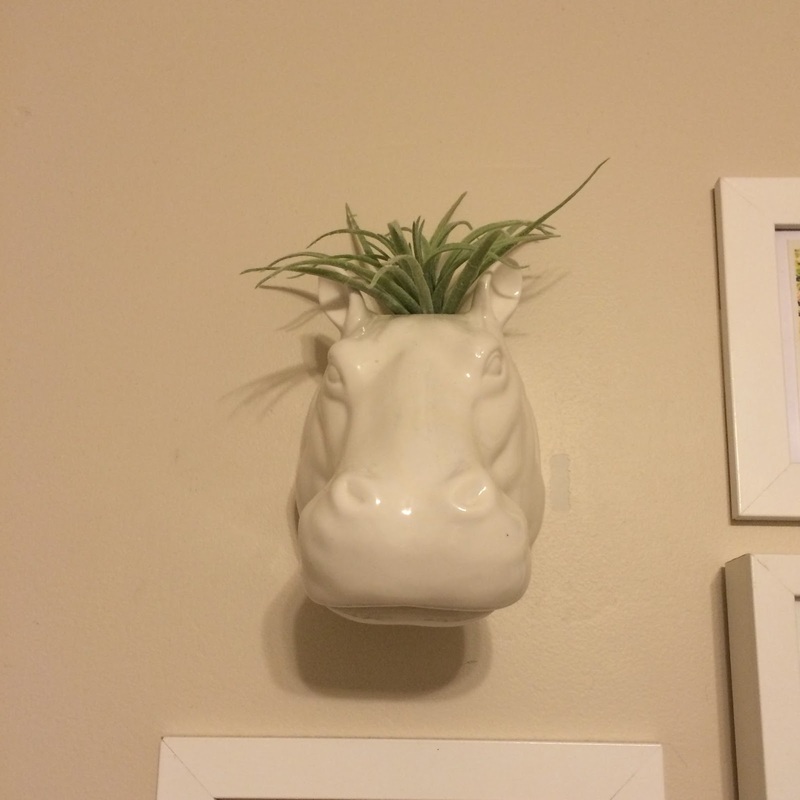 For instance, in my Hippo bust that my friend Holly got me for Christmas. So that's how my garden, er, my indoor menagerie grows. How about yours? A few days ago a friend and former classmate posted this article on Facebook and asked for open discussion. A conversation then occurred in the comment section between myself and another former classmate, who felt that the author might have been overreacting in some instances to what was just genuine curiosity from some people. For example, a lot of the encounters the author talks about are people commenting on or touching (without permission) her hair. Without probably realizing it, this former classmate pointed out a problem area for most majority persons trying to be good allies. It is not a minority individual's job to educate the majority, who are usually too lazy to bother learning anything outside their personal experience until a minority person enters their sphere. Curiosity is not an excuse to put the burden of your understanding onto others. If you are curious, educate yourself. In an instance such as this, my friend opened up an opportunity for dialogue and in such situations it is probably okay to ask questions. However, in the instances that the author describes, people think they are engaging the author in conversation when really they are making the author's existence all about themselves, "Hey, you're different than me, tell me why." Not to mention the violation of personal space involved in touching another person. This article resonated with me because I do happen to have a fascination and respect for African-American hair. There can be so much style, power, and expression in the way people of color wear their hair. Natural, relaxed, weaves, extensions, wigs, and lots more aspects that I have yet to educate myself on. (I also happen to have hair like straw, as the author describes some of the individuals she encounters.) But I don't just walk up to my friends and ask them to tell me about their hair. And I certainly don't just put my hands in their hair. So I've read articles, listened to podcasts, read books, and watch documentaries. For example, on the topic of black hair I listened to a Stuff Mom Never Told You podcast with Lori L. Tharpe you can find here. 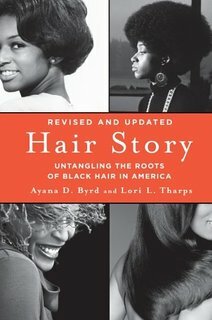 Lori L. Tharpe is co-author of Hair Story: Untangling the Roots of Black Hair in America. I haven't gotten to read it yet, but it's on my (way too long) To-Read list. I also watched the documentary Good Hair. Admittedly, I was assigned to watch this doc in my Film & TV Analysis class, but it was already on my (also way too long) To-Watch list. If you are interested in this topic like I am, the documentary or the podcast is probably the quickest way to acquaint yourself with it and learn why when you ask a black woman, or man for that matter, about their hair, you are asking a whole lot more than you realize. Making the effort to educate yourself can actually open up much more meaningful conversations with your friends. 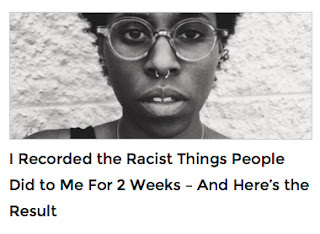 Saying, "I read this book/article/saw this movie/heard this interview and would like to know what you think," is much more effective than basically asking someone to educate you about some facet of their oppression. If you want to learn more about being a good ally to oppressed groups/individuals, check out the article 10 Common Things Well-Intentioned Allies Do That Are Actually Counterproductive on Everyday Feminism (Hint: we've been talking about #4 here). Since August of 2015 I've been working as a part-time sales associate at The Resale Shop, which is a social enterprise of the non-profit Center for Transforming Lives. I decided shortly before graduation that I wanted to do a charitable project with any gift money I received. 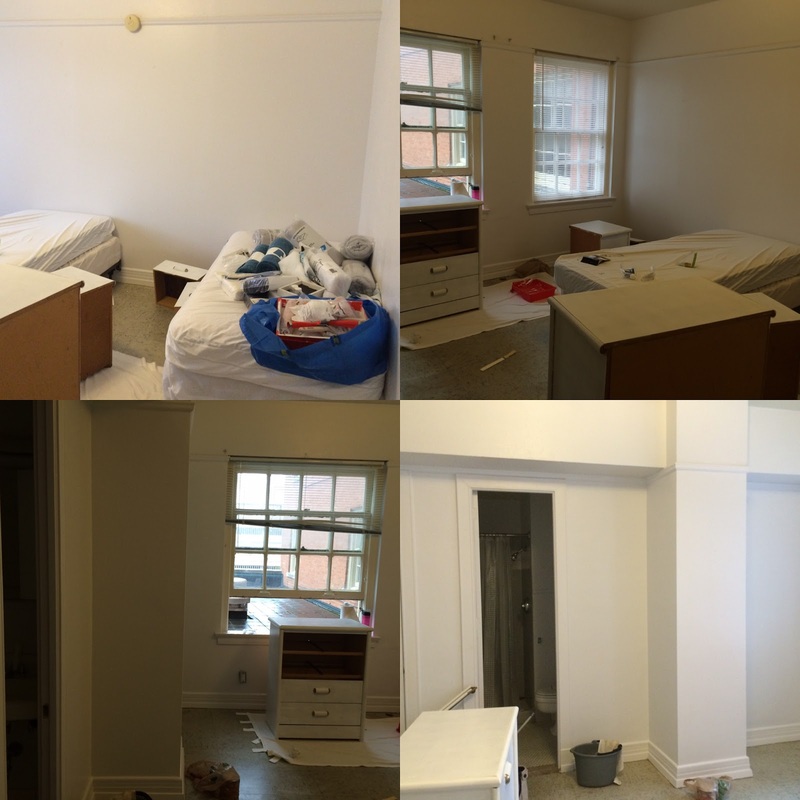 A perfect opportunity arose when I discovered that our organization was looking to makeover several of the rooms in our emergency women's shelter. I stepped in after a volunteer group painted one of the rooms and finished the transformation. It was hard work, but so much fun. It felt really good to spend my gift money on something for others and it was wonderful to see the reactions of the people who run and utilize the shelter. I didn't think to take a lot of "before" pictures, so these are some shots of the room once I had already started painting the furniture. 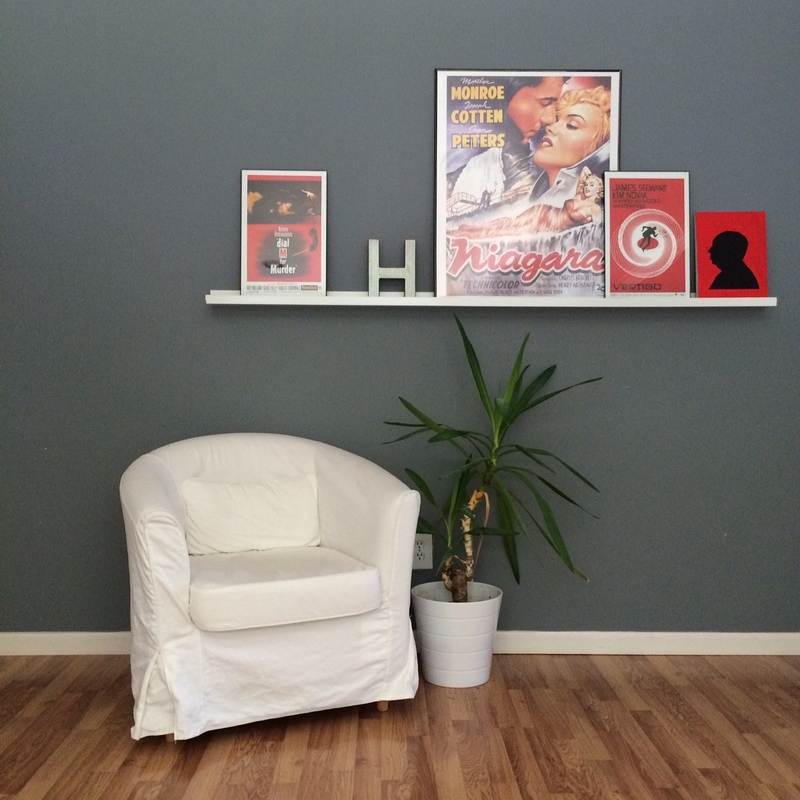 I painted the existing furniture the same color as the walls to make them recede and make the room feel bigger. I bought the bath and bedding items at Ikea (aka heaven), and the frames on mega-sale at Michael's. All the art is free stuff I found via Pinterest (view my project board here), with the exception of the Maya Angelou quote. I was in love with this print, but I obviously couldn't spend $400 on it, and it was out of stock even if I could. So I made my own version. All the larger pieces I had printed at Staples, the smaller ones I did at home on card stock. I actually have an entire second room's worth of stuff sitting in my office, just waiting to go to work when another shelter room has been painted and is ready for sprucing up. I can't wait to show that one when I've had the opportunity to do it. Below are the results of the project. If you live in the DFW area and would be interested in supporting our mission through volunteer work, please go here to learn more about our volunteer opportunities or come see me at The Resale Shop! Jawsgirly has been my internet nom de plume since 1998, so it only seemed natural to use it for the name of my website. My husband's handle is Jawshoeuh and I'm his girly, so Jawshoeuh + girly = Jawsgirly. I've been his girly for over 18 years now, and I am oh so thankful for him and his love everyday. This blog is a reinvigoration and reimagining of my earlier blog, On This Harvest Moon. Much has changed for me since I stopped blogging several years ago. I graduated from the University of North Texas with a Bachelors Degree in History and Radio, Television, Film and a minor in Women's & Gender Studies. I'm getting ready to start the MA program in Critical Cultural Studies in UNT's Department of Media Arts. My education has been key in defining who I am and who I want to be, so that will be a topic I write about a lot. My main focus in media arts is Feminist media analysis, and within my history degree I focused on the experiences of women and minorities in the U.S. My feminist motto is, "Go Intersectional or Go Home." For me to be what I consider a good feminist, I need to be addressing all the various discriminations that women can face- not just sexism. And I also need to be aware of how these discriminations can intertwine with societal concepts of gender to negatively impact men as well. 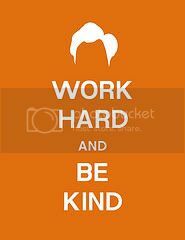 I try to apply that to my study of American history, to my media work, and to my daily life. I hope to write about current events, but I also plan to do some media analysis writing here to talk about how our culture of discrimination shows up in our cultural products. I definitely plan to write about my grad school experiences and the plans I'm making for my future. I want to be a university level professor, which means I've got to go all the way to the big PhD. As a woman in her mid-30s, what is that going to be like? I don't know yet, but when I do I'll tell you. I suffer from a chronic illness called Fibromyalgia, along with an assortment of non-life-threatening-but-still-pretty-annoying conditions. I'd be lying if I said it doesn't make life a bit difficult sometimes. I'm trying to improve my level of self-care, so I'm sure that I will write about my experiences with my conditions from time to time. Now that I'm done trying to sound important, I must confess I'm really just a goofball at heart. I'm a fully acknowledged Pinterest addict. I love doing little projects around my house, or others houses for that matter. I love to cook, when I have the energy. I'm trying to get back into running 5ks and enjoy working out socially. When I'm not completely absorbed by school or exhausted, I do some work with a local comedy group. 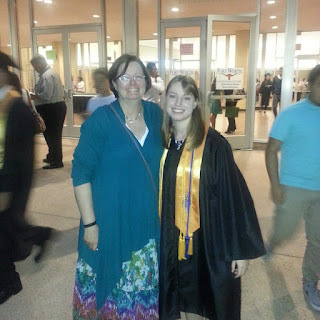 I'm figuring out how to balance our financial needs with the costs of going to grad school. I have to clean house, and do laundry, and feed our cat. We need to replace my husband's car. I'll be writing about all that general daily life stuff some, too. So, that's what a Jawsgirly is. A girl in love with a jawshoeuh, a feminist, a student, a goofball, and once again, a blogger.